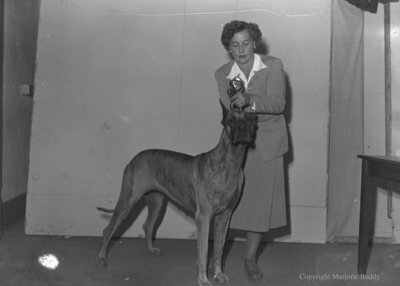 A black and white large format negative of Betty Hyslop and her dog at the Toronto Kennel Club Show at the Canadian National Exhibition. This negative has started to degrade. Betty Hyslop and Dog, September 2, 1949, Marjorie Ruddy. Whitby Archives A2013_040_331.